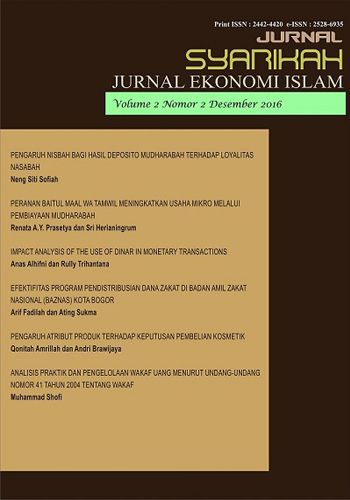 Jurnal Syarikah : Jurnal Ekonomi Islam is a scientific journal published to support the development of Islamic economy. Jurnal Syarikah : Jurnal Ekonomi Islam will include articles related to the study of Islamic economics in both theoretical and practical studies. The editors receive contributions of articles, scientific papers from the scientific enthusiasts of economic studies and Islamic finance. The editing process is necessary without changing the intent and content of the writing. The Journal is published twice a year on Juny and December. Jurnal Syarikah is licensed under a Creative Commons Attribution-ShareAlike 4.0 International License.